"This type of canine skin infection is caused by multiple types of fungi, with the most common type referred to as dog ringworm. The most common symptom is the development of skin lesions which appear as round hairless patches of skin with rough edges. It looks as if the dog hair has broken off at the base or has been shaved down. Dog skin lesions are seen all over a dog, but primarily appear on the ears, head, tail and on the front of the paws. Skin areas tend to look pale in color." 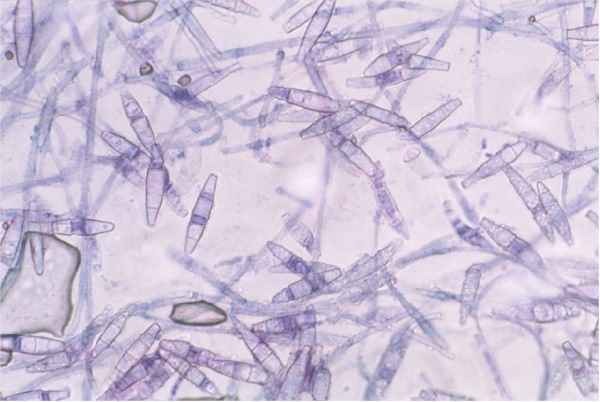 Canine fungal skin infection is most often contracted by contact with fungal spores found in soil. Sometimes dogs get fungal infections from other animals or, more rarely, even from humans. 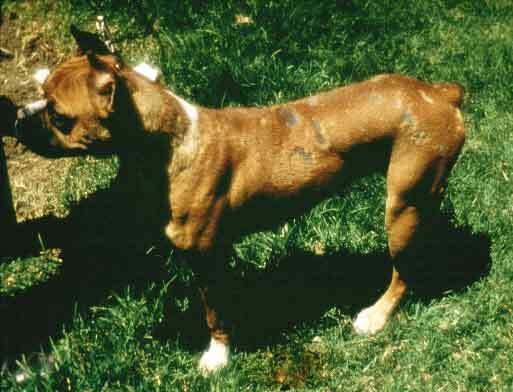 Dog Ringworm (dermatophytosis) - Dog ringworm is the most common canine skin fungus. It looks like a red circle with pale centers. Despite the name, there are no worms involved; the disease gets its name from its appearance. It should be noted that people can catch ringworm from animals, so if your dog has ringworm, watch for symptoms on your own skin. Yeast infection (Malassezia) - another common infection. It causes red, scaly skin that may also appear greasy. It is often smelly as well. It is itchy and will cause your dog to scratch. Blastomycosis - less common. It is a systemic infection that causes respiratory problems, generalized weakness, a poor appetite, and even blindness. One of the first signs of the illness, however, may be round, oozing sores on the skin. The sores may crust over. Histoplasmosis - is another less common fungal infection. Like blastomycosis, it is a systemic infection and causes weight loss, cough, fever and diarrhea. It causes enlarged lymph nodes that may feel like lumps on the sides of your dog’s neck and in the “arm pits.” Sores may also appear on the skin. Different types of fungal skin infections will also be diagnosed in different ways. Ringworm can usually be diagnosed just by looking at the skin. If needed, your vet can examine the skin under a special ultraviolet light called a woods light. Your vet may be able to diagnose a yeast infection just by looking at it. To be sure, your vet may rub a cotton swab on the infected area and examine it under a microscope. Blastomycosis can be diagnosed by examining secretions from the sores under a microscope. Histoplasmosis is diagnosed by blood tests. Fungal infections in dogs are usually treated with a combination of anti-fungal drugs, topical medications and anti-fungal medicated shampoos. Shaving your dog’s fur around the affected area may also help the healing process. When handling a dog with ringworm you must protect yourself with gloves, and wearing an apron or clothing that you wash subsequent to handling the pet. Ringworm on people can affect skin anywhere your body. For dog ringworm, natural remedies such as Dermisil for Ringworm have a solid track record for treating the condition. As part of the treatment plan, you should use a vacuum (that has a filter) to remove any skin and hair from areas where your dog roams, as this is what the fungus spores feed on. Use a disinfectant that contains benzalkonium chloride such as Benzarid to kill any spores, since fungus spores can live for up to 18 months possibly reinfecting your pet. Other options include chlorine bleach - dilute (1:10) - , or strong detergents. Note that products containing Chlorhexidine have not proven to be effective as an environmental cleaner. Identifying the source of the infection is important so that you can protect your dog from becoming re-infected. Since the source is usually soil, think about where the dog has been digging lately. Short of having the soil tested for fungal spores (an expensive and not widely available option for most people), the best you can do is to provide a new area for digging or to provide new activities to occupy your pet.